IPC Supply, Inc. was formed in 1999 through the merger of Industrial Products, Inc. of Greer, SC (established 1993) and Chem-Tex, Inc. of Anderson, SC (established 1960). The companies were consolidated in Anderson and moved to the current location in late 1999. 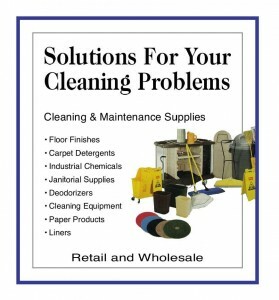 We offer a complete line of supplies for the janitorial market. These include cleaning chemicals, wax mops, buckets, brooms, trash can liners, etc and cleaning equipment. Our most popular items are shown in the product section of this catalog. Specialty products are not shown here, but are available. We also offer a full line of plastic and foam cups, plates and containers. We mix chemicals and blend powders for OEM accounts to their specifications. In addition to supplying products in large quantities, such as drums and totes, we provide in-house private label bottling in pints, quarts and gallons. IPC Supply is a certified WBENC woman owned business. We service over 300 customers ranging from very large manufacturing facilities to schools and government facilities to small businesses. The expertise of our employees, the large inventory of over 3,000 items and our delivery service provide our customers with the confidence and value needed for their business.